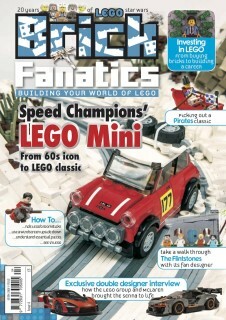 Issue 4 of Brick Fanatics Magazine is available for purchase through brickfanatics.com now, and in shops from April. The fourth edition of the monthly print publication all about LEGO is available to order at brickfanatics.com/magazine from today, and takes its lead from Speed Champions, courtesy of a cover build straight out of 1967’s Monte Carlo Rally. Inside, we tell the remarkable story of the Mini Cooper S and celebrate its iconic status and entry into LEGO history as an official set with a unique build. We’ve not even told you everything inside Issue 4 – once more, this is a magazine packed with variety, insight and inspiration. We have had great fun putting it together, and we are sure you will enjoy reading it. Brick Fanatics Magazine is available worldwide through brickfanatics.com/magazine. You can place orders on single issues of Issue 4 from today (with an additional fee for postage and packaging), as well as subscribe for 12-issue and 24-issue runs. Subscriptions offer free issues, free postage and delivery of every issue of Brick Fanatics Magazine fastest and first. You can also order single copies of Issues 1, 2 and 3, while stocks last. Issue 4 orders will ship from the end of next week, with postage duration variable depending on location. Brick Fanatics Magazine is also available in stores in the UK and US. Issue 4 will appear in stores in the UK from April 4, and you can find a list of stockists here. A US publication date for Issue 4, as well as a list of Barnes & Noble stockists will follow shortly. In the meantime, pick up a copy of Issue 3, currently on shelves in the UK, and due to appear in US stores from April 18. Every purchase of a single issue or subscription to Brick Fanatics Magazine directly supports the work that we are doing. We are passionate LEGO fans determined to bring the very best brick-based content to you every day at brickfanatics.com and every month with Brick Fanatics Magazine. Thank you to everyone so far who has shown us such support. Sweet! Excited to pick it up! Hi - anyone had a chance to compare with 'Blocks' ?